41624-CZ is rated 4.8 out of 5 by 18. Rated 5 out of 5 by Rondonavich from Decorative and sturdy This useful grab bar looks like a beautiful towel bar but is very secure and sturdy. It has saved me several times as I have slipped in my shower and caught myself with the grab bar. Rated 4 out of 5 by Mike B from Delta Grab Bar The grab bar exceeded my expectations. The finish brushed nickel finish was high quality and matched my other fixtures. The installation easy and very secure. I would highly recommend this product and felt it was a good value. Rated 5 out of 5 by Dom from Grab Bar I purchased this grab bar for all three of my bathrooms, and am quite satisfied with the priduct. The concealed design is what prompted me to purchase this product. It also looks great in the bathroom. Rated 5 out of 5 by Boyd from Delta Grab Bar I remodeled my master and used all Delta products. This grab bar was a perfect match. Hight quality. Rated 5 out of 5 by Jason from Works Great. Easy to Install We laid out the backing properly for this before tile. Then drilled in properly with the correct anchors in the right spots. This looks awesome and matches the rest of the finishes. If you can drill through tile you can install this. EASY. And the finish is top notch. Installed proper backing is everything to make this last for years to come so it won't pull out. Rated 5 out of 5 by ADF from high quality product I purchased this to match my Hansgrohe shower fixtures and it really complements the style. Can this be installed in a tile shower? Are your stainless steel grab bars and towel bars plated or solid? Is the ss finish polished or matte? I am renovating a bathroom and selecting new bath fixtures and accessories. 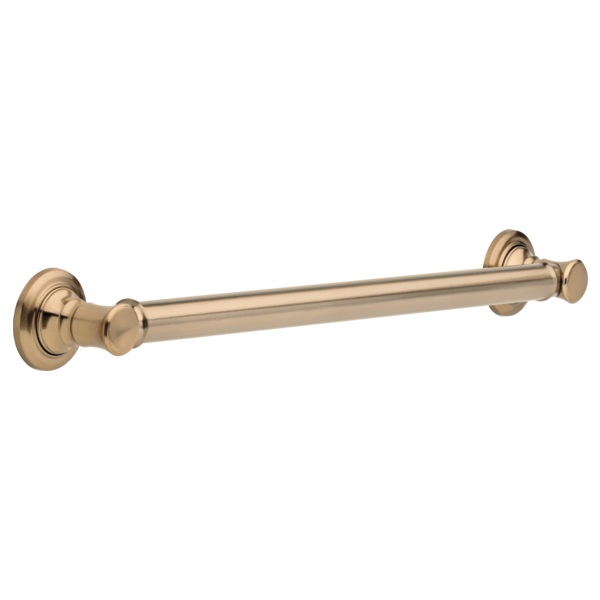 Is the grab bar model 41624-RB (in Venetian Bronze finish) of solid brass construction? Can this grab bar in chrome be installed inside a shower? Can this be installed on a glass shower door as a handle/towel bar?